Leading off today: We play football on natural grass and on artificial surfaces. Saturday reminded us that actual games are not played on paper. The rematch of last fall's Section 4 Class C championship game had mismatch written all over it as Oneonta (0-6) had to travel to (Newark Valley (5-1), ranked 21st in the state this week. That went out the window when Ryan Packard made a 20-yard field goal as time expired to carry Oneonta to its first victory of the season. Newark Valley has now lost back-to-back games for the first times since the 2012 season. Quite a pinch-hitter: Cam Crosier, moved from the slot to running back after an injury to starter Joe Stewart, scored a Kenmore West-record seven touchdowns in a 49-14 rout of Kenmore East. Crosier scored on runs of 23 and 4 yards to build a 16-0 lead, He'd follow with four more short TD runs and a 33-yard TD catch. He finished with 17 carries for 147 yards and two catches for 46 yards. William Floyd dominates: Senior wide receiver/cornerback caught a 64-yard touchdown pass from Trey Berry midway through the second quarter and then picked off a pass and returned it 77 yards for a score as William Floyd defeated Ward Melville 42-12. Driver hit Matt Wagner streaking for the end zone for a 44-yard touchdown on the ensuing possession to break the contest open. William Floyd is ranked first and Ward Melville 10th in the state in Class AA. Slugfest: Freshman Will Benjamin ran for three touchdowns and sophomore Tyler Szalkowski threw for three more as Aquinas, ranked seventh in the state, outlasted St. Francis 55-49 to clinch the No. 1 seed in the Section 5 Class AA tournament. "It was a very entertaining and kind of fun to coach," Aquinas coach Derek Annechino said. "There were moments that were very hairy, but the kids battled through it and won." After Xavier Janczylik of St. Francis ran back the opening kickoff 100 yards for a score, Aquinas took a 40-21 lead into halftime thanks in part to Szalkowski TD throws of 28 and 48 yards to Ulysees Russell in the first quarter and two Benjamin scoring runs on the first half. St. Francis made it a one-score margin three times in the second half but the Little Irish rode it out. Rueben Torres, who missed Aquinas' game last week with an injury, rushed 19 times for 186 yards. St. Francis QB Jake Ritts completed 28 of 46 passes for 371 yards and three touchdowns. Full day's work: Khairi Manns led Class AA No. 6 New Rochelle over Timber Creek (N.J.) by catching a touchdown pass, forcing a fumble, recording a sack and blocking two field goals, one of which was returned for a Huguenots touchdown. More Class AA: Archbishop Stepinac scored 21 unanswered points after trailing 17-14 to snap a four-game losing streak by beating No. 17 Monsignor Farrell 35-17. Shawn Harris Jr. caught a 60-yard TD pass and returned a punt 68 yards for another score. • Alijah James scored on second-half carries of 14 and 3 yards to rally No. 23 Oceanside past No. 20 Farmingdale 19-12. Class A Sixth-ranked Westhampton posted its 18th straight win by edging No. 13 Half Hollow Hills West 17-13. The Westhampton defense held the Colts to 84 yards and five first downs in the final 4 minutes. HHHW opened the scoring in the with a 12-play, 74-yard drive capped by Justin Brown's 4-yard run in the first quarter, but Westhampton's Tyler Nolan returned the ensuing kickoff 85 yards for a touchdown. • No. 30 Fordham Prep edged No. 10 Moore Catholic 35-27 by rattling off the contest's final 20 points. Moore lost star running back Justin Lacks to an ankle injury in the first quarter after another player rolled up on his leg an Lacks' short touchdown run. Pleasantville falls: The weekend's top Class B surprise saw Westlake take down No. 9 Pleasantville 22-14 as Andrew DeBiase scored two TD and had a game-sealing interception with 1:01 left in the rematch of the 2017 Section 1 final that was decided in double overtime. Jack Howe hit Danny Melillo for the go-ahead touchdown late in the third quarter. HF-L drives to win: Honeoye Falls-Lima QB Turner Wilson drove his team 86 yards with no timeouts in the last 1:30, connecting with Mitch Slymon from 2 yards out with :05.9 left to beat Class B No. 28 University Prep 14-8. The Cougars won a Week 5 game vs. Watkins Glen/Odessa-Montour on a hook-and-ladder play when Wilson passed to Derek Childs, who then lateralled to Mason Ferrara who took it into the end zone as time expired. That drive also started 80 yards from the end zone with less than a minute to go. "Wow, we certainly have a flair for the dramatic," coach John Russ said. "We made completions when we had to and the guys made the plays." More Class B: Thomas Viscio rushed for 142 yards and three TDs on six carries as No. 23 Seaford posted a 45-16 win over East Rockaway, ranked 17th in Class C.
Viscio scored on 50- and 56-yard runs in the fourth quarter for the Vikings, who rushed for 451 yards. Joe Angelastro rushed for 282 yards on 19 carries and two touchdowns including a 60-yard run in the third quarter. • No. 29 Beekmantown turned the ball over seven times -- four on interceptions by Jerin Sargent -- in a 24-0 loss to Moriah, tied for 10th in Class D. Moriah's Jeff Strieble threw touchdown passes to Sargent and Maddox Blaise, while Dyllon Bougor rushed for 111 yards and another score. Bougor picked off a pair of passes. Beaver River rallies: Beaver River came back from a score down in the fourth quarter to edge Class D No. 7 Onondaga 35-34. Sam Bush (15-for-21, 222 yards, three TDs) connected with Cory Woodward for a 16-yard touchdown pass and Woodward kicked the go-ahead extra point. Cameron Murphy made five catches for 137 yards and two touchdowns. Notes: Eldred beat Dover 38-22 to break its 28-game losing streak, the longest active skein in the state. Kaiyer Fields ran 21 times for 355 yards, but it wasn't enough to stop Jamestown from beating Buffalo McKinley 48-28. 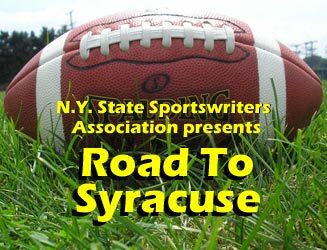 Scoreboard: You can check out all of the Week 7 scores on our Road to Syracuse website and also view how ranked teams fared.